My daughter loves macaroni & cheese - but (and it's a big 'but'), she'll only eat the packet variety. You know the one I mean, right? It takes around 4 minutes in the microwave and then you pour in the powder and mix it through for a bowl or gloopy orange mush. She thinks it's the best thing ever. I've tried to make my own macaroni cheese for her, but she's never liked my attempts. I tried making Mac n Cheese again over the weekend, and I think we're on a winner! 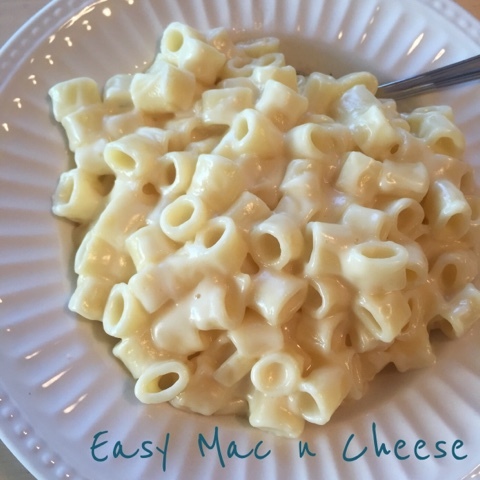 Here's my easy Mac n Cheese recipe. I know it's been done a million times and there are a lot of recipes available, but here's my version (incase you'd like to try it). 1. Put the pasta on to boil and follow the instructions on the packet - usually around 10-12 minutes. 2. When the pasta is almost cooked, melt the butter in a small saucepan on a medium heat. 3. Add the flour and stir it through the butter until it's well combined and firmed up. 4. Use a small whisk to stir the milk a little at a time into the butter/flour mixture. When you can feel it thickening, add a little more milk and whisk. Continue this until it's all stirred through and thickened. At this stage, the pasta should be cooked, so turn off the heat. 5. Now that the sauce is thick, add the cheese and curry powder. Stir through until it's melted and gooey. Turn off the heat. 6. Strain the water out of the pasta pan. Pour the cheese sauce over the hot pasta and stir it through until all of the pasta is coated in cheesy deliciousness. Serve to your little people, but make sure you keep some for yourself. It's really (really) good and because it's quite rich, a little goes a long way. Serves 4 people easily or serves 5-6 as a side dish. If you use my recipe, please let me know how you go (and whether your little people like it). Macaroni cheese (ALWAYS homemade) is my go-to dish in winter - it's just so delicious, warming and comforting. I usually add chopped, pre-cooked bacon and onion to make it a bit more special. came out. I add some shredded cheddar and extra milk and serve it with turkey sausage, green peas, and applesauce. Fantastic!